Two abstracts presented at the Lunar Planetary Science Conference (LPSC) in Houston, Texas last week have revealed new findings about the Carancas meteor fall which challenge conventional theories about impact events. The observation of a fireball corkscrewing its way through the South American sky, followed by a strong explosion and the appearance of a water-logged hole in the ground made headlines around the world on 15 September last year. 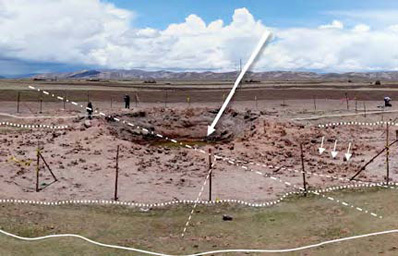 The crater, located near the border between Peru and Bolivia, has now been constrained to about 14 metres in diameter and 5 metres deep, with a 1 metre high rim raised above the initially flat surface. Material ejected from the crater was thrown out to a distance of 200 metres. Although the impact occurred into a dry stream, water saturated sands existed at just 1 metre below the surface, resulting in the crater becoming infilled with water within half an hour of its formation. The boiling water reported by local residents was attributed to the initial energy deposition of the impact and subsequent clumps of clay falling into the water several days to months later which caused frothing; heat from the impact blast would only have been able to sustain the bubbling for up to an hour. Picture of the Carancas impact crater as presented by Schultz at the LPSC Conference this March. The large arrow indicates the approximate trajectory along the dash-dot line and the smaller arrows show erosion of the ejected material where water was drained from the floor in a different expedition. The solid lines trace the bank of the dry stream, the dotted lines the extent of the grassy top soil, and the dashed lines the uprange region where there is a gap in the ejecta. Image from Schultz et al. (2008), 39th LPSC, abstract 2409. The recovery of stony material was surprising because usually only predominantly iron-rich meteorites survive passage through the Earth’s atmosphere sufficiently intact to make such an impression on the ground surface. In the case of a relatively fragile stony meteorite, it is common to see the meteor break up and impact the surface as a cloud of fragments. Observations of the incoming fireball showed that it was rotating, but that it did not shed a significant amount of material during its atmospheric entry, suggesting that it was largely intact when it struck the surface. Speaking at the LPSC conference, Professor Peter Schultz of Brown University reported that the impacting body was probably around a metre in diameter and struck at relatively high speed — 6.5 kilometres per second (or 24,000 kilometres per hour). Schultz and his team suggest that the Carancas meteorite may have initially broken up and then reformed in such a way as to make it more aerodynamic, enabling it to slam into the ground, rather than being braked by the friction of the Earth’s atmosphere so that it gently falls to the surface. In a different study, computer simulations by Dr Thomas Kenkmann from Humbolt University in Berlin suggest that the impact occurred at a much slower velocity — just 160 metres per second — and at a much steeper angle. The team’s best case scenario assumes a strong projectile which fragments into several pieces which are dispersed over a large area, but that only the largest fragment makes a crater. The new findings contradict conventional impact theory that small stony fragments can’t produce large craters, and has raised the possibility that there may be similar craters on the Earth caused by stony meteorites that may have previously gone undetected.